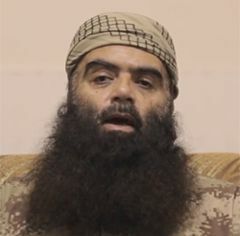 For at least a week, there have been reports that the leader of Jabhat al Nusra in Syria, Abū Muhammad al-Jūlānī, (sometimes spelled al-Jolani and al-Joulani and al-Golani), is about to announce the group's split from al Qaida. Abu Firas al-Suri, a longtime al Qaida veteran who relocated from Yemen to Syria in 2012-2013, and became a spokesman for AQ's Syrian branch Jabhat al Nusra, has reportedly been killed in an airstrike in Idlib. Update: The soldiers were released and put in Red Cross vans. Also released as expected: Saja al Dulaimi, ex-wife of ISIS leader al-Baghdadi, She says she divorced him six years ago and intends to go to Turkey. Lebanon and al Nusra have finally agreed on the terms of a prisoner exchange for the 16 Lebanese military members held hostage by the al-Qaida linked group since August, 2014. Nusra delivered the soldiers to the release point last night.